At Marmalade & Mobile Vet we strive to treat all of our patients the way we would want our own cats and dogs to be treated. We endeavor to stay in touch with our clients regarding any critical situation. When we do blood work on your pet you will be contacted promptly by the veterinarian after we receive the results from the lab; and we also give you the option to receive your results via a phone call or e-mail. 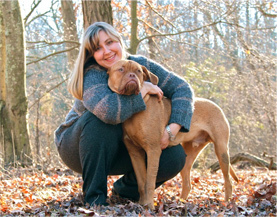 Dr. Forsyth received her veterinary training from the University of Pennsylvania, graduating in 2001. In 2003 she developed an interest in holistic medicine after it helped one of her dogs to recover from a serious illness. She completed the 120 hour Professional Course in veterinary homeopathy through ANHC/Dr. Richard Pitcairn in 2003, the 96 hour Advanced Course in veterinary homeopathy in 1996, and passed the qualifying exam for certification in veterinary homeopathy in 2005. She also has over 30 hours of training in Veterinary Integrative Nutrition through Standard Process. She provides nutritional counseling for her patients in the form of food, nutraceuticals, and herbs. Along with alternative/complimentary medicine, Dr. Forsyth also provides conventional medicine and has a special interest in dentistry, having completed advanced training with the Animal Dental Training Center in Baltimore, MD. Dr. Forsyth currently resides in Sewell, NJ with her husband and 5 dogs: Petunia, Seaweed, Skookum, Margaux, and Martin. The dogs enjoy hiking and swimming in the stream behind their house. 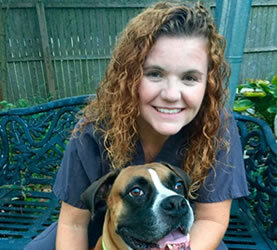 BJ came to Marmalade and Mobile Vet in March 2015 with over 20 years experience as a veterinary technician. 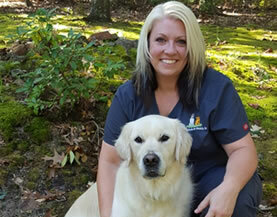 With her love for animals she started her career in Las Vegas Nevada in 1991 and has worked for veterinary hospitals in Pennsylvania, Tennessee, and New Jersey. She currently resides in her hometown of Williamstown New Jersey with her husband Bob and her stepdaughter Sara. Her four legged family members consist of an English Cream Golden Retriever named Timber and four feisty felines Gary, Carl, Monkey and Lizzie. She enjoys spending her free time with family and friends, as well as hiking with her dog and his tennis ball, horseback riding, fishing, bicycling, watching movies and playing video games. Eileen Mannino received a Certificate in Computerized Accounting from the Academy of Computer Careers in Berlin, NJ in 1997. She has worked in the Accounting field and even helped to run her husband’s painting business for the past 14 years. But her love of animals and desire to work with them always made her want to do something more, which is what led her to Dr. Forsyth. Eileen Mannino currently resides in Deptford New Jersey with her husband, their two daughters Ariana and Sabrina, and their Boxer named Buddy, who loves to play soccer and go on long walks. She also enjoys working with horses and maintains a 90 gallon reef system aquarium and also a small backyard pond. Crocheting and crafting are also hobbies she likes to do in her spare time. Desiree Somogy is a lifetime resident of Mantua, NJ. She developed a interest and love for animals at a very young age. She studied at Camden county college in the veterinary technician program in 2004. 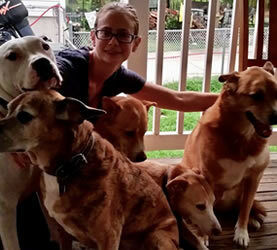 Desiree has been working in the veterinary field for 9 years. She is always striving to care and help animals as well as educate owners to properly care for their pets.